Is translatesAutoresizingMaskIntoConstraints set to false on the views we're adding constraints to? Are the priorities of each of constraint, as well as content hugging and compression resistance priorities (Bite #69) what we expect them to be? "Can this required constraint work at a 999 priority?" Remember, Auto Layout will try to get as close to our desired result as possible, while still satisfying all other constraints. Identifiers help us more easily spot the important bits in those giant log outputs Auto Layout loves to show us. They can be added in code or in Interface Builder. When debugging complex layouts, it can sometimes be helpful to look at only the constraints involving a specific problem view or area. We can use this function to grab an array of the constraints affecting a particular axis. Neat. When all else fails, don't be afraid to go in and start temporarily commenting-out or disabling constraints then observe the results. This can often lead to unexpected insights into how constraints are behaving. A great way to fight Auto Layout issues is to try to catch them before they happen. That means becoming more familiar with Auto Layout, which means practice. For example: When a question or issue comes up, create a new 'dummy' Xcode project. Throw some views and constraints in there and try it out. Tweak some priorities, observe their effects in the isolated environment. When in doubt, try it out! Layout Guides & Anchors were added in iOS 9/OS X 10.11 as a more convenient way to add Auto Layout constraints. Let's dive in. Note: Layout Guides are defined in code using UILayoutGuide on iOS and NSLayoutGuide on OS X. ...into a set of much more readable short lines of code (shown below). The new code reads much more easily from left to right, and is much easier to scan and reason about what's going on. UIView, NSView, and UILayoutGuide all have lots of new anchor properties available to make adding constraints to them much simpler than before. We also get a little extra type safety as a bonus. Auto Layout works great in Interface Builder, but it's often helpful to have the flexibility and clarity of wiring up constraints in code. Let's dive in. We'll add a view and set translatesAutoresizingMaskIntoConstraints to false. Normally Interface Builder does this automatically under the hood, but since we're working in code we'll need to set it ourselves. Don't want any funky autoresizing constraints in there meddling around. view.height = 0.0 * nothing + constant. We've added a simple constraint telling Auto Layout to try to keep the width of our button at 44 points. Auto Layout does as its told and collapses our button making it completely unreadable. Don't worry, we can use Compression Resistance to stop this. We select our button in Interface Builder, head over to the size inspector (⌘⌥ + 5), and set it's horizontal Compression Resistance Priority to 1000. Now, we'll change the priority of our original 44 point width constraint to something less than 1000. We'll use 999 to emphasize the point, but this could be any number from 0 - 999. UIStackView changes everything. New in iOS 9, you can think of UIStackView as an abstraction layer on top of Auto Layout. It arranges it's subviews and manages their constraints for you. One way to think about UIStackView is as the UIKit-born cousin to WKInterfaceGroup, the main layout component for building Apple Watch apps with WatchKit. 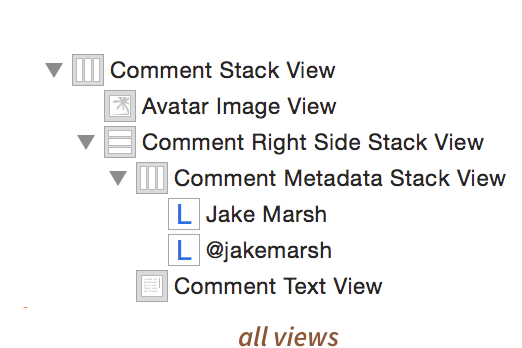 UIStackViews layout their arranged subviews horizontally or vertically, and they provide options for how arranged subviews should be aligned and distributed.